Laika’s loving this warm, muddy weather. How about you? The amazing story of the 51 dogs seized from Michael Vick’s dog fighting ring in 2007 and their road to being rehabilitated and re-homed. These 48 dogs who have proven, beyond a shadow of a doubt, that fighting was something that was forced on them, not something they were born to do. Once they had the opportunity to become companions, they took it and ran with it. 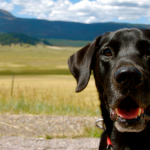 Take a look at some of the breakthrough scientific studies that have been done on canine intelligence over the past decade. It’s thought that a dogs intelligence is roughly equivalent to that of a 2.5 year old child. What do you think? This is such a beautiful post; I think it’s a perfect reminder to all of us that our dogs change, adapt, and learn to evolve just as we do. It always amazes me when I look back on Laika 3 years ago and Laika now – as she peacefully rests on my lap. 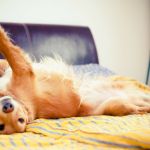 How Worried Should You Be About Your Pets Health? 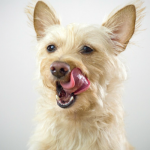 Here’s a great article regarding all of the health advice (and panic) that’s been thrown around lately regarding the canine influenza outbreak in Chicago. I can’t get over how awesome, cute, and simple this trick is. I’m going to working on it with Laika this weekend. Be sure to check out the whole positive training blog hop; it’s amazing what you can teach your dog in 10 minutes. Taking on a challenging dog isn’t for everyone, yet some of us actually seek out dogs with ‘issues.’ Great perspective on what it’s like to work with a complicated dog – and all the great lessons learned from it. I’m not a very religious person, but I like to think some great force interevened, because he clearly picked me, and I think we’re both the best thing that’s ever happened to each other. 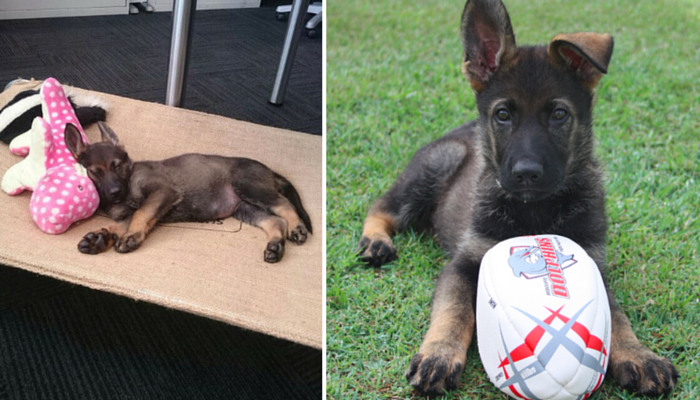 Meet Whiskey the police puppy in training. She’s the cute Shepherd in the featured image above. Check out more of Whiskey’s training progress (and videos) on instagram. Don’t worry – the ending is all good. Oops, should I have said spoiler alert? 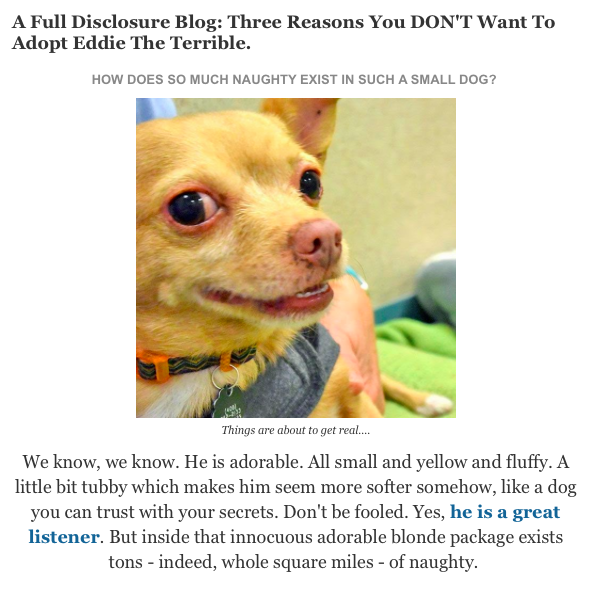 Read the whole story to see all of Eddie’s ‘bad’ adoption ad. This post contains affiliate links, if you make a purchase I’ll earn a small commission. Should I feel bad for laughing so hard at this? Such a heartwarming story (and great dad for creating the pack). A brand new Hope For Paws video. Do you have any great posts to share? Post your favorites in the comments or submit it for a chance to be featured in one of our weekly roundups. Have a great weekend. « Who Doesn’t Love Silly Dog Poems? I know isn’t it wonderful? Such a beautiful way with words – the sentiment comes across so clearly. Thanks for sharing my post! 🙂 I love your weekly roundups. You provide such great information that I didn’t come across in the week myself. I love that article on the Vicktory dogs. We can all learn such great life lessons from those dogs. They came out so wonderfully from such a tragic situation. I can’t get over the Vicktory dogs either; I just keep thinking about how amazing their story is. 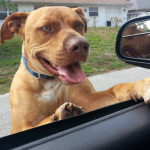 To go from that into forever homes just proves how loyal dogs are deep down inside. 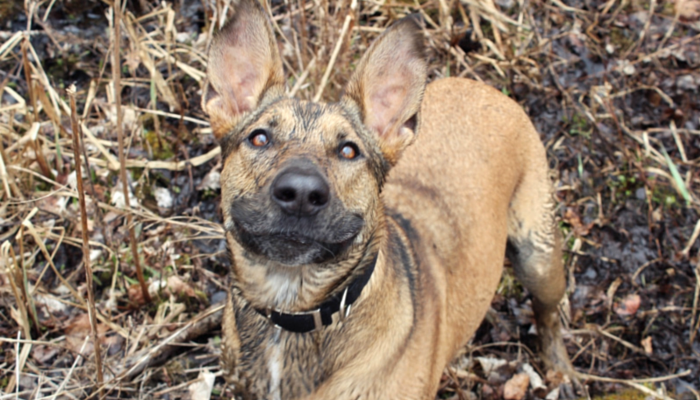 I’m in love with the Laika in the mud picture! Great round up. Hope you had a nice weekend!